This past month, I had the pleasure of attending the World Engineering Education Forum (WEEF) in Buenos Aires. The conference is meant to bring together stakeholders from around the world in an effort to address the major challenges that are faced in engineering education through global strategies and partnerships. As with many of the conferences that are centred on engineering education, the thought is that if you can get the right people together into a room to share their ideas and experiences, the engineering education community can begin to work together to solve both individual and shared problems. I have been to several conferences over the past few months and though it sometimes seems like my contribution as a booth engineer is somewhat limited in the context of global engineering education strategy, there are advantages. Above: the poster announcing the Quanser Driving Simulator Demonstration at WEEF 2012. The Driving Simulator is a recent example of the controls education advances Quanser is developing to improve the educational experience engineering students have at university. While traditional attendees have opportunities to meet new people and share mutual interests, I would suggest that the majority of interactions are with established long-standing colleges. I would conservatively venture that though I was tied to a booth for the majority of the conference, over a three day period I probably interacted with 90% of the attendees. Though I would like to believe that this was largely due to my stunning good looks and charm, it was honestly probably due to the exciting driving simulator demo that I was in front of. Despite the relatively small size of the WEEF conference, I think we had more students and professors drive the simulator on the first two days of the conference than the previous two conferences combined. Though I don’t have the most comprehensive Spanish vocabulary (freno, acelerador, rápido!, etc. ), I believe that the sheer number of people who stopped by our booth offered an invaluable opportunity for Hans Fernandez and me to share information about the innovative engineering education products and approaches that Quanser offers. 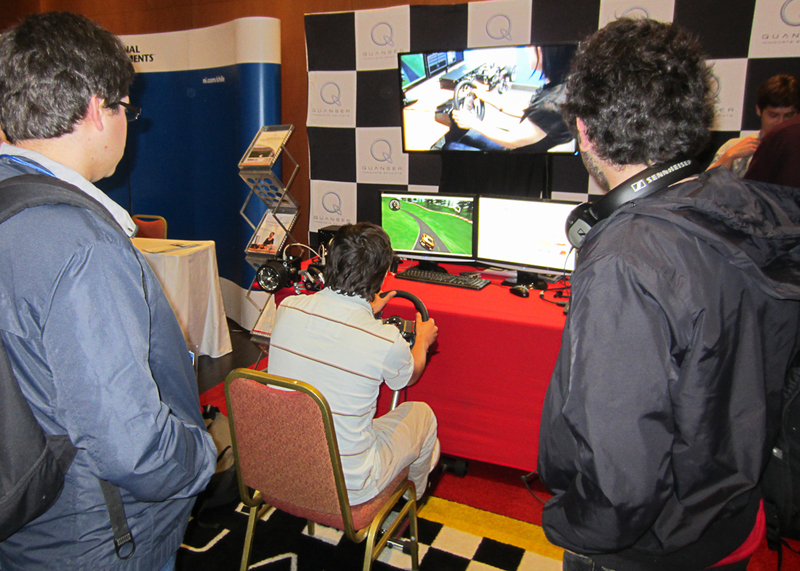 Over one hundred eager engineering students from South America and around the world took the Quanser Driving Simulator for a test drive and enjoyed an exciting, hands-on educational experience. The WEEF conference in particular was a fantastic opportunity for us to put the driving simulator experience into the hands of over a hundred engineering students from all over South America and the world. Their reaction to the platform was very exciting, with several students returning day after day to try to improve their times or share the system with their friends. It’s always reassuring when a professor really latches onto the driving simulator concept, immediately grasping the benefits of the platform. More than anything, however, it was the students’ interest in the guts of the system and the interaction between the controllers, simulation, and hardware that proved to me that we are on the right track. As a curriculum engineer, my day-to-day job is to try and improve the educational experience that students have while at university. At the end of the day, all of the strategies and partnerships that come from these conferences are in the hands of the students. By interacting with students directly and meeting organizations like Student Platform for Engineering Education Development (SPEED), I firmly believe that we have a chance to fundamentally improve the educational experience for engineering students from the bottom up. Peter Martin is a Curriculum Developer at Quanser.